Buy 2 units and receive a 10% discount. Buy 3 units or more and receive a 15% discount. 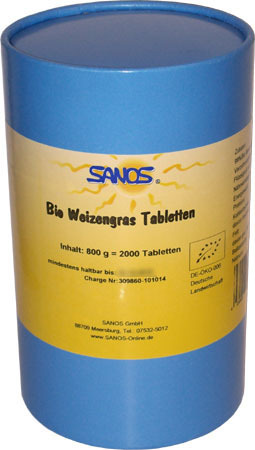 Tablets: 99 % wheatgrass powder, 1 % silicic acid. Stir 1 teaspoon 3 times daily into 150-200 ml of water or fruit juice and enjoy before or between meals. The intake can be changed individually, as required. The powder can also be sprinkled over food as a „seasoning“, adding a spicy touch to meals.